At the Melbourne launch of Eona in April, Alison Goodman said she’d struggled with the process of writing her first sequel, the follow-up to The Two Pearls of Wisdom (aka Eon). Safe to say, she has mastered the art, for this is both a stunning read and a striking how-to for writers. Eona opens with a neat summary chapter, written as a historical document, that quickly sketches in the required facts to ground the story, and then we’re into it, with nary a slackening of the rising tension. Eona, a female Dragoneye who spent much of her life masquerading as a boy, has a very full plate. She must adjust to the cultural restraints of once again living as a woman in a man’s world; she must harness her magic, tied to a pantheon of mythic dragon spirits that are, as one might expect from the quasi Chinese setting, tied into the well-being of the land; and she must navigate the murky, choppy waters that lie between duty, power and loveDominating her life are two powerful men: the denied Emperor Kygo and the treacherous Dragoneye Ido. One seeks to claim a throne, the other all the might of the dragons. Both offer intense allure to the young Eona, but can she truly trust the motive of either? For that matter, can she even trust her own feelings when they are so discoloured by her magical abilities and ancestry? The world is sketched with delicate aplomb – enough detail to give a picture of the environment and the society, but not enough to bog down story. And it’s in story where Eona shines, where the reader will take delight and the writer will take notes. There is no gain without loss, no victory without a bigger challenge ahead, no skirting of hard decisions. Even a bath can become a storyteller’s device to raise the stakes. Each twist makes sense, thanks to the fine control of characters’ motivations. Even the secondary characters have their lives being lived, with varying degrees of impact on the story, and some adding deft touches of detail to the world. While the usurper Sethon is the closest thing to the stereotypical bad guy – and such a deliciously nasty one, too – Kygo and Ido represent enigmatic hero and villain in which the reader can invest a great deal of emotion as they play their tug-of-war with Eona’s heart. There is raw bloodshed and beautifully evoked sexual tension, a touch of Gothic family secrets (oh so many secrets! ), some powerfully appealing characters such as the tragic Dela and Ryko to name but two, and a compelling journey, not just through a ravaged empire but through Eona’s coming of age. At the end of the day, it is Eona’s character – her nobility and courage and inherent goodness – that will be tested, and it is only at that point in the grand conclusion that she, and the reader, can really know what her decision will be. Two Pearls came out in 2008, and the intervening wait for this concluding title of the duology has been rewarded with a near flawless conclusion. 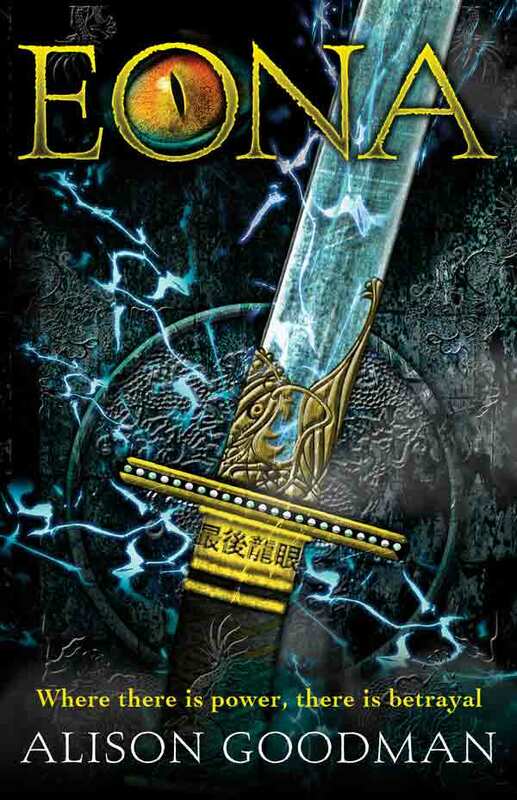 Eona, published in the UK as the far more romantic Necklace of the Gods, is everything a sequel should be. Whether Goodman, who has a varied back catalogue of consistently superb stories, revisits such mythic fantasy again or turns her attention to another genre remains to be seen, but there is one comfort: based on this and its predecessor, the wait, however long, will be well worth it.